Elsa is a business owner in Wirralong. She’s a hairdresser, making most of her profit through weddings. Elsa’s shop is busy and when Jack enters for the first time, she doesn’t have room on her schedule to help him. He needs an emergency cut and uses her equipment instead. The next time Jack walks into her shop Elsa makes sure she does have a moment for him. Jack doesn’t have any friends in Wirralong and he’s completely alone and Elsa would love to change that. Will she be able to get him out of his shell and show him that not everyone wants him to leave town because they dislike his father? Jack has made his fortune mining opals. His mother passed on this passion for gems and Jack has made finding precious stones his life work. He leaves his mine behind to stay in Wirralong after the sudden death of his mother. It doesn’t feel like home, but Elsa’s there and she’s the woman of his dreams. Jack is afraid his bad reputation will harm Elsa’s business, but the woman is stubborn and only sees his kindness. Will he be brave enough to give her a chance or will prejudice and gossip chase Jack out of Wirralong once more? Elsa’s Stand is a beautiful love story. Both Elsa and Jack are very special. They’ve got big hearts and are sweet and generous. Their love is truly wonderful. They’re soul mates and it’s clear they belong with each other. I love it when a connection between two main characters runs so deep and really enjoyed reading about these terrific main characters. Elsa and Jack have many problems to deal with and the obstacles they have on their way are often tough to overcome, so finding out if they’d have a chance to be happy together kept me on the edge of my seat. I'm a big fan of small town romance and Cathryn Hein knows how to make a community feel real. She has written an amazing intense love story. I loved her gorgeous pure descriptions of each emotion she writes about, it makes her story come to life in a fantastic way. Elsa’s Stand is passionate, moving and heartwarming. I absolutely adored this fantastic gem of a romantic story, it melted my heart and the fabulous feelgood vibe it's given me will stay with me for a long time. 5.0 out of 5 starsLovely addition to the series! 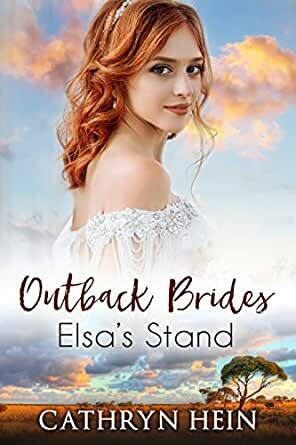 Elsa’s Stand is an absolutely delightful outback romance, and in a fascinating twist, I’m incredibly well qualified to review some of the ‘technical’ aspects of the plot. Jack Hargreaves, the hero, is an opal miner from Lightning Ridge, left a property by his mother with a sapphire find hidden on it… somewhere. And it just so happens that I’m a member of a lapidary club, with experience of both opal and sapphire hunting myself. If Cathryn Hein hasn’t been fossicking, she’s definitely consulted thoroughly with someone who has. She uses all the right terminology and really gets the mindset of the lone miner chasing that elusive big strike. Returning home to Wirralong after his mother’s sudden death, Jack’s first encounter with Elsa is when he walks into her hairdresser’s shop half an hour before his mother’s funeral after a two-day drive. Desperately in need of a shave and a haircut, he helps himself to her clippers when she can’t fit him in because she’s preparing a bride for her wedding, and leaves a hundred bucks on the counter before changing his shirt out in the street. Born and raised in Wirralong, Elsa knows exactly who Jack is - the son of a black sheep who left chasing dreams of opal. Now he’s back, and staying on his mother’s property searching for a legendary sapphire strike she claimed to have found before her death. Some of the town’s most prominent citizens have already judged him by the sins of his father, but Elsa’s not that type. She’s fascinated by the quiet giant’s strength and fortitude, and he in turn is enchanted by her sunny attitude to life. I thought Jack and Elsa were such a cute couple. I’d actually say the book was told more from Jack’s point of view than Elsa’s; certainly we got much more of his background, but then I think he was a more nuanced character all around. Elsa was charming but a little bit too good to be true, and I must admit I burst out laughing the first time I read about a hairdresser’s work outfit involving strappy, high-heeled sandals. I’ve never yet met a hairdresser who doesn’t wear the most comfortable flats she can find, considering how much time she’ll spend on her feet in the course of a working day. Twice Elsa wore heels to work, and then when she and Jack finally got a date, she wore flats! Even with that amusingly unlikely scenario, I enjoyed this so much I have to give it five stars. This is a lovely addition to a delightful series, and can absolutely be read as a standalone. Disclaimer; I received a copy of this book for review through NetGalley. 5.0 out of 5 starsI loved this story so much! Oh goodness this is a good story. Third in the Outback Brides series, Elsa’s Stand is set in the northern Victorian town of Wirralong. Mining is central to this story as Jack Hargreaves, an outwardly strong, confident and self-assured man returns to his home town for his mother’s funeral. I adore Jack, a huge, muscled tough looking man who is carrying a world of hurt on his shoulders, having been shunned by many of the townsfolk because of his father. He’s a loner but as you get to know Jack you realise he’s keeping to himself to protect his feelings. He’s also a decent, hardworking and caring man and oh my goodness the struggle he has to contain himself when he meets Elsa. I loved his “Christ on a bicycle” declarations, even if they were only muttered to himself. I couldn’t help feeling sorry for the poor man. Elsa is pretty much the exact opposite of Jack. She’s gregarious, fun-loving, a bit of a flirt and a bit of a tease, but she’s also loyal and generous and willing to stand up for what she believes in. I loved the way she stood up for Jack in the face of disapproval from some of the townspeople. This story has so much appeal for me that it’s hard to say exactly what I liked most about it. The setting, the characters, the plot and the pace were all perfect and I galloped through the story as fast as I could, loving each and every page along the way. I liked Elsa and Jack’s characters. The emotions portrayed by Jack held merit and at times, were moving. Elsa’s nickname fit well in the story to depict her character. A quick read in the Outback Brides series.